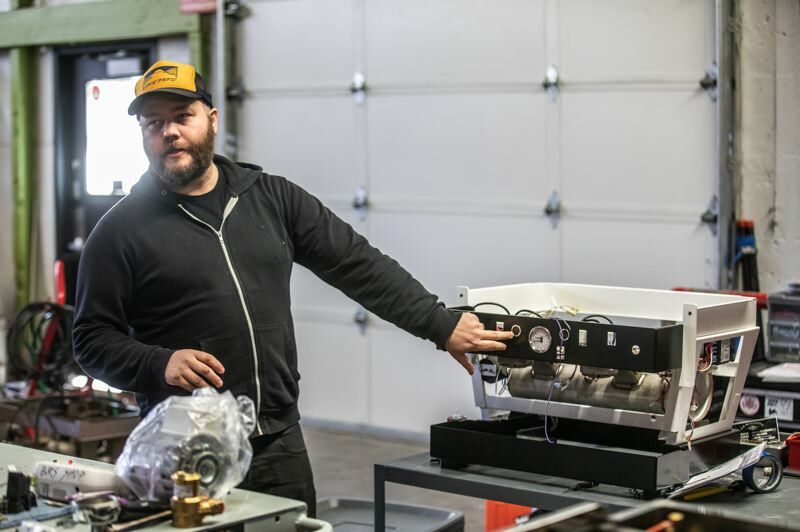 Espresso keeps Portland running, but who keeps the espresso machines running? Servicing the hundreds of espresso machines that have popped up not just in cafes, but in hotels and offices is an industry in itself. However, it's a fragmented one, with a few small players and one strong brand that has ballooned in the last three years. 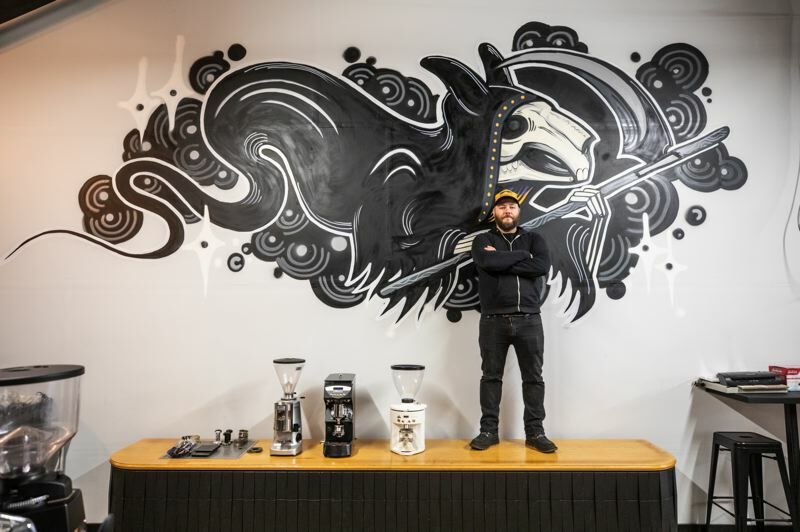 Black Rabbit Service Co. vans can be seen flitting around the city, popping the top on a La Marzocco or a Slayer, tearing out boilers and rewinding grinder motors. Their warehouse on the industrial east side holds half a million dollars' worth of parts, according to cofounder Jason "Double J" Johnson. That fact holds the key to their success. First off, Black Rabbit are Old Portland royalty. They have social capital. Although they formed only three years ago, Johnson and his cofounder Alex Lambert came out of Stumptown Coffee, where they ran the service division. Their job for 10 years was opening stores in places like New Orleans and flying around to fix machines. "We want a bigger space but we also want to stay in the area because it's super central. Roaster's Row is nearby: Coava, Heart, Stumptown, Water Avenue, Buckman coffee factory...We work with them all," Johnson said. To him Roasters Row is a genuine community, where people know and trust one another. It doesn't hurt that the warehouse space is very good value. His firm assumed the lease of Picture This, a camera equipment business that had been there since the 1980s. Johnson and Lambert were with Stumptown for 10 years. 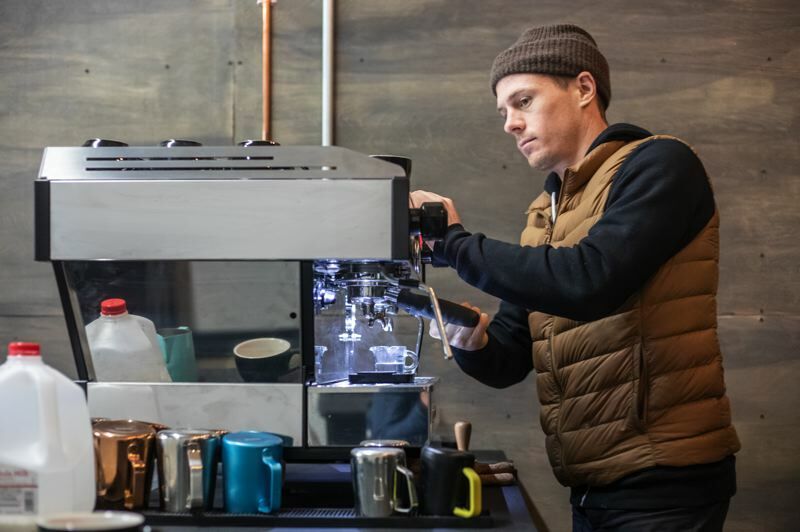 It got to the point where they were being asked to install, maintain and recommend espresso machines outside the Stumptown network, which they were not allowed to do. So, they took a risk and decided to go it alone. Black Rabbit now has locations in Portland, Seattle and Los Angeles. 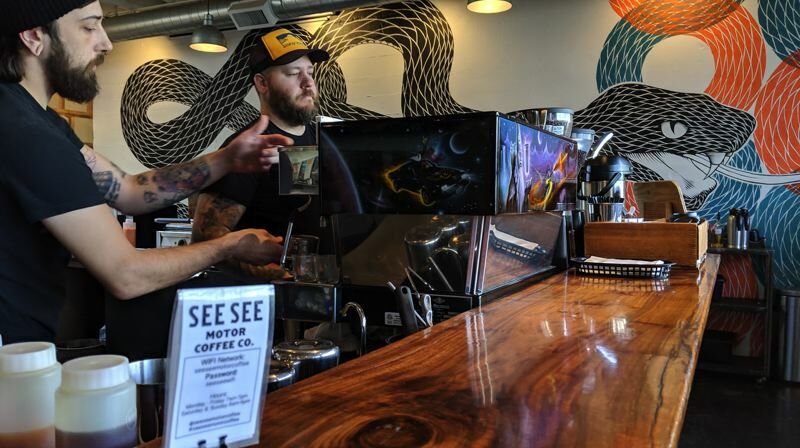 For an espresso machine owner without a service contract, they charge $90 an hour in the northwest, and outside Portland or Seattle there's an $80 an hour one-way travel fee. Espresso machines are like old motorcycles, and require lots of maintenance. "Stumptown (coffee) is religious about service," he said. "Every six weeks." He added, "We try and promote preventive maintenance the most, the basic stuff: gaskets, baskets, screens, water filtration, changing the burrs on a grinder. That way we can prevent bigger things going wrong. It's like getting an oil change on your car." Waiting too long can mean burrs on a grinder get blunt, which can then burn out a capacitor or worse yet, a motor. 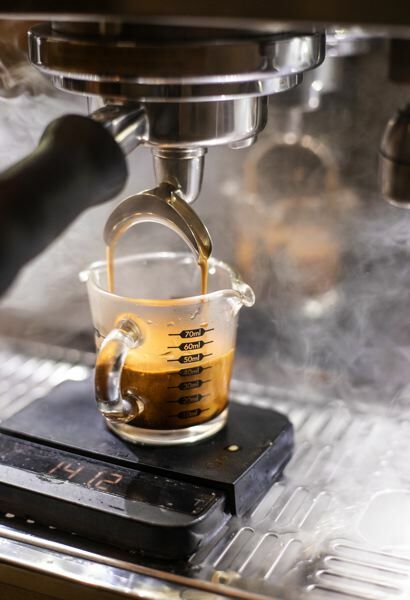 Anything that messes with the grind, or the water pressure, or the water chemistry, can throw off the art of the coffee shot, and that means trouble. Even minor problems can mean "the barista would have to fight the machine to make the coffee." Johnson got his start as a teenager in Fresno, California when his parents got into restaurants and later coffee roasting. "My dad owned restaurants and we had a friend who would fix things. The espresso machine would break, ovens, ice machines, and we'd stand around try and figure it out. My dad's advice was, 'Learn how to fix something and you'll always have a job.'" In 2006 at Stumptown there were just three cafes and one person in the service department. He made drinks, bagged beans and delivered them around the city. "When the opportunity to get into the tech side of it came I jumped all over it." Black Rabbit has trained more than 20 apprentices. Johnson says anyone reasonably handy can get to maintenance level in a few months, and in about two years can tear apart a wide range of coffee machines. Johnson says if the job is like anything it's like heating and air conditioning. Most machines have boilers, a pump, heating elements, and flow restrictors which work like a carburetor. 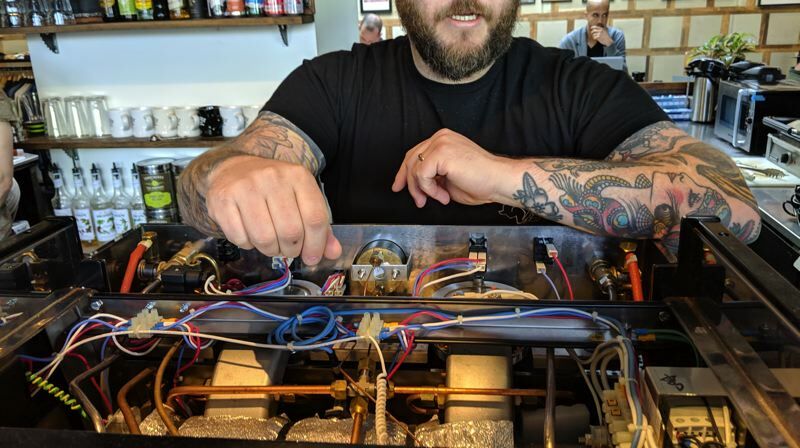 He walks across Sandy Boulevard to the See See Motor Coffee Co., a coffee shop that is mostly laptop workers during the day and bike lovers' hangout on the weekends, to show what's under the hood of a two-head La Marzocco Linea Classic. This one has a Wizard-themed custom paint job but inside it's simple. The work is about adjusting pressure and checking for leaks. Johnson runs a spoon around the connectors looking for condensation which would indicate a steam leak. One black box the size of a pack of Tic Tacs represents all the electronics needed. It just regulates water levels. Chandler Slaughter, the barista on duty that day, has made coffee previously with another Marzocco and a Strada. He likes this machine. "It's easy, reliable, analog. It's very simple, just two switches and one knob." Slaughter estimates it doesn't often go out of synch, maybe every two months. Back at the warehouse the front space is dominated by work benches and storage. But at the rear stand two immaculate machines, a $24,000 Victoria Arduino Black Eagle and a $16,000 La Marzocco. The Arduino is a super-automatic machine, meaning all you have to do is press a button. It also has a scale, so you know when a 2-ounce shot is complete. Starbucks used to use Marzoccos. Thermoplan, a Swiss company had a factory in Seattle just to serve them. Then, in 2008, Starbucks switched to Thermoplan's Mastrena Superautomatic machines to save money on training and have a more consistent product. They were even made lower so that baristas could see their customers. Lambert pulls a shot on the La Marzocco. The pump hums and the water gurgles, then the inky black shot trickles out. The coffee is Stumptown Hairbender. Coffee science is a real thing. Impurities can clog filters and limescale can build up. Portland has soft water it can run straight into the machines through a simple filter. Vancouver, Washington has hard water so espresso purists must use a softener if not full reverse osmosis (distilled) water. Even then, they have to blend minerals back into the water to make it taste good and make the machine function. The level probes that tell how much water is in the tank rely on electrical conductivity and need certain minerals. It's no surprise then that Black Rabbit teaches the art of coffee making. The two machines in the warehouse are for classes. It's easier than doing it in a live coffee shop. "You can walk up to a machine, make adjustments and get a shot," after three hours of lessons said Johnson. To get started, you don't have to know about bars of pressure or even the temperature of the brewing water. "We try to keep it user friendly." He did have a guy in who was a welder who was asking a lot of informed questions about the materials, but that's not that common. To stand out, a good café now has to offer interesting roasts and different strengths for the purists. "Training in a café is difficult so we created this lab to offer a space, with your own trainer." Classes range from $75 an hour to $150 for three hours. They also teach milk steaming and latte art: "Learn to do a heart and a rosette. The coffee consumer is interested, they see it on Instagram. There's also a big push to do home espresso, more people are getting interested." For example, there used to be a hard rule about brewing espresso at nine bars pressure. "They're changing way they roast, they play around with how they brew it. Now there's a slow ramp up, a lot of complicated electronics came out to please those people." Some machines have a paddle or slider to adjust pressure during the pulling of the shot. It's the kind of detail Johnson's team has to understand, but also keep in perspective. Asked if sales or service is their main money-maker, he said, "To me, they go hand-in-hand, selling or service. I don't think you should be selling if you can't fix them. We love to sell the machine, the service package and consult on a project." They just customized a Linea for Good Coffee at the new Woodlark Hotel, adding dot matrix-style digital timers and a paint job. The L.A. operation is in Lincoln Heights, within view of Dodger Stadium. The three technicians are locals, and it is growing. They have done installations for rock stars such as Sting of the Police and Flea of the Red Hot Chili Peppers. "We don't talk to Flea, we talk to his guy," he said with a laugh. Black Rabbit also sells machines, so white-glove service for a celebrity is part of being a certified dealer. In Portland, those kind of clients are doctors in Lake Oswego and West Linn, who have La Marzocco GS3s, which cost around $7,000. On weekends, Johnson goes to coffee shops that he really likes. His tipple? "I like a single-origin coffee, a washed Latin American coffee, big and chocolatey." He drinks Americanos — espresso with hot water. "For espresso I like blends," he says, a little heretically, then adds, "Once in a while I get a mocha for a treat." Black Rabbit have their feet in the world of coffee snobbery, but perform an essentially blue-collar task. The company logo is a giant rat dressed like Death. Johnson is also in the Portland music scene. "I've played bass and drums in a bunch of old punk bands who are no good." Rather like the pizza chain Sizzle Pie — which also grew of out Stumptown — there's a rock and roll feel to the art work around the office, and a maturing punk rock spirit. Johnson sees the company as creating jobs and performing a valuable service. He needs new people. "We can train them. We look for someone interested and hungry to do more in the industry. You have all these baristas seeing careers. They find the technical side of it exciting. You're out in in a van, seeing people, learning a trade." Black Rabbit hosts workshops for women in Portland, Seattle and Los Angeles. The next one is called "Let's Fix It!" February 22 and 23 at Black Rabbit Service Co. Los Angeles. Spend the weekend in hands-on workshops hosted by industry leading women specializing in technical repair work. 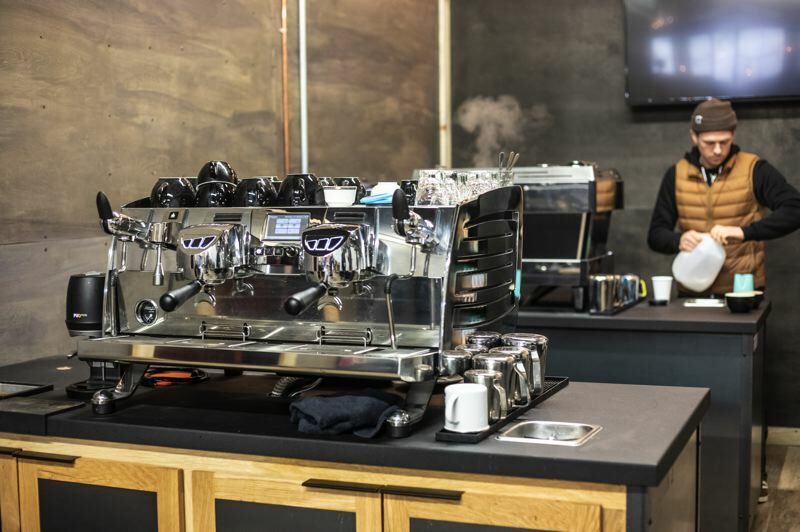 These workshops are designed to encourage baristas to explore some of the basic skills required to repair and maintain brewing and grinding equipment. Let's Fix It! focuses on encouraging women to become equipment technicians, but is open to any and all. Together, we'll go through an introduction to the skills needed to become an equipment tech, with each session being taught by leading women in the technical field of the Coffee Industry. At the end of each event, you'll walk away with the knowledge set and skills to take greater ownership of your coffee equipment, and be started on the path to become an equipment tech. Coffee equipment sales and service. Owners: Alex Lambert, Jason "Double J" Johnson and one private investor.